The following is a list of several reputable companies with which Western River Expeditions chooses to do business. If any are of interest, please take a moment to browse their websites. Situated on the banks of the Colorado River about 15 miles outside of Moab, Red Cliffs Adventure Lodge provides beautiful accommodations before or after your trip. Horseback riding is available on site as well as tennis, pool, and jacuzzi. Many of our guests choose to stay at the Big Horn Lodge in Moab, Utah which offers country-rustic lodging on the Main Street of Moab. 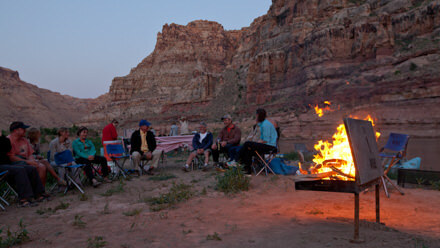 Sorrel River Ranch Resort and Spa is Moab Utah's highest rated resort hotel and guest ranch vacation destination. The Gonzo is a fabulous boutique-style property, convenient to our Moab Adventure Center and downtown shopping and dining. Rafting in West Virginia » Adventures on the Gorge provides white water rafting trips, canopy tours, and more in West Virginia on the New River and Gauley River. Rafting in New England » Located in the Berkshires in western Massachusetts, Zoar offers whitewater rafting trips, white water kayak and whitewater canoe clinics and rock climbing adventures. Rafting in the Northwest » Whitewater rafting trips in Idaho and Oregon. They deliver top notch rafting trips in perfect alignment with the quality you'd expect from Western River Expeditions. Rafting in California » Whitewater Voyages is California's largest, most experienced, most popular whitewater rafting outfitter. Rafting in Colorado » Whitewater rafting trips on the Arkansas River, Colorado River, Dolores River, Gunnison River, and North Platte River in Colorado are a specialty. Rafting in Costa Rica » Pacuare Lodge is an internationally acclaimed eco-lodge on the banks of Costa Rica's Pacuare River. Rafting America is a resource for learning about rafting, and finding the top whitewater outfitters in North and South America. Canada Rafting » REO Rafting Resort provides vacations and rafting excursion in beautiful British Columbia, Canada. The National Park Service website serves as an excellent resource to planning your trip with Western River Expeditions. You can find great information for whatever National Park is near your destination. Find Recreational River Reports provided by the Colorado Basin River Forecast Center. This service provides river flows in cubic feet per second for the Colorado River through Grand Canyon, Westwater Canyon, and Cataract Canyon plus flows for the Green River. The Bureau of Land Management (BLM) is responsible for managing 262 million acres of land--about one-eighth of the land in the United States--and about 300 million additional acres of subsurface mineral resources. The Bureau is also responsible for wildfire management and suppression on 388 million acres. The Grand Canyon River Outfitters Association (GCROA) is a non-profit trade group made up of the sixteen professional river outfitters which are contracted with the National Park Service to provide the public with multi-day whitewater river trips within the Grand Canyon National Park. Find the whitewater rafting equipment and related outdoor adventure products you need, for your business, your store or your upcoming river trip - from the experts at Man of Rubber. DIB has produced inflatable boats for rescue squads, fire departments, law enforcement, and various government agencies operating throughout the world under the entire spectrum of operational conditions...and they also make our J-Rigs! Maravia makes high quality paddle rafts and oar-rig boats. We especially like the rainbow of colors they deliver, making our "Skittles Flotilla" on Utah's rivers standout in beautiful variety. NRS has become the de-facto leader in supplying river supplies to companies like ours, as well as to the general public with a great online presence. They supply anything from rescue ropes and carabiners, to souvenir keychains and everything in between. Ever sleep a night on the river in a tent? Alps is our chosen vendor for tents, chairs and sleeping bags. They make lots of other convenient camp comforts too! Harvey Partner turns his steel into gold when he makes our custom river boxes, stoves, toilets, and even custom orders like our square dutch ovens and amazing coffee kettles. Every day of a river trip is tolerable because Jack welds plastic dry bags, paco pads to sit or sleep on, and a variety of odd but useful creations. Red Rock Outfitters is Western's online division for selling the personal supplies you will need and want on the river. New Headings provides online ordering and shipping to make this popular option viable for our guests.